So, let's say you've got this Sun SPARCstation 5, and you like the compact dimensions and classy design. But you don't really know very much about Solaris, and you certainly don't know enough about Linux to wrangle it onto a recalcitrant TurboSPARC. And let's say you do need a low-power, low noise PC. 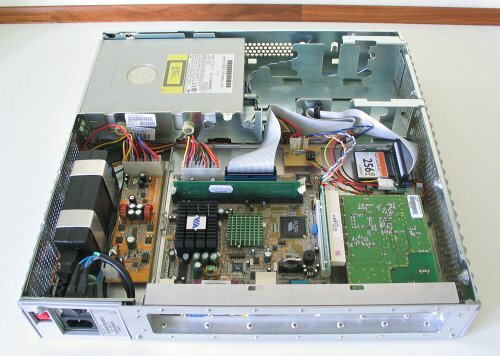 The answer: stuff in a VIA EPIA 5000 motherboard and turn it into an EDENstation 5. VIA's Eden CPU (clocked at 533MHz on the EPIA 5000 motherboard) provides modest processing power by modern standards, but it's quite adequate for a small file server, web server or firewall. It consumes very little power and doesn't need a fan, only a passive heat sink. Combined with a fanless PSU and a compact flash card instead of a hard disk, it can be built into a completely silent PC. Read on to see exactly how I did just that. You can click on any of the photos to see a larger version in a pop-up window. I can already hear the wails of the die-hard SPARCisti, appalled at the idea of butchering a perfectly good SPARCstation. Well to tell the truth I felt a certain pang of guilt about it myself. So I did my conversion without any cutting, drilling or other modification of any of the original components. It would take about 5 minutes to plug the SPARC parts back in and the machine would be restored to its former glory. Score 1 for Sun's impressively modular design. 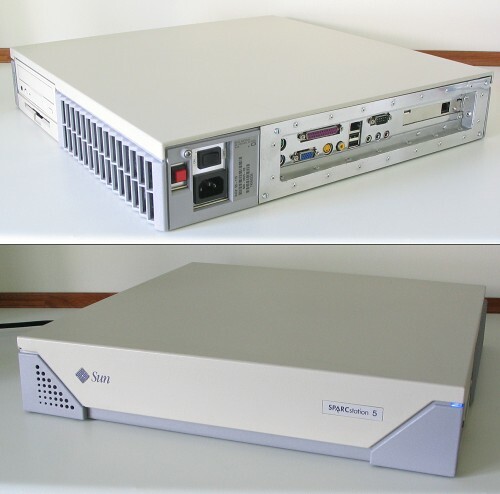 So what about this SPARCstation 5 then? The SS5 is based on Sun's "Aurora" chassis, one of the "pizza-box" SPARCstation designs. 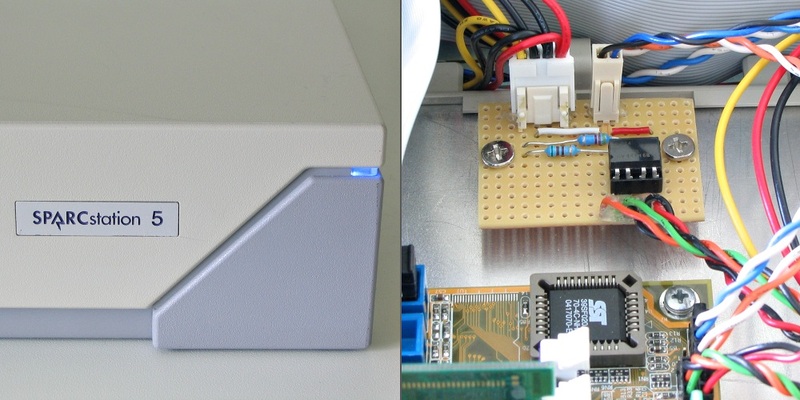 Some other SPARCstations used the "lunch-box" form factor, like the IPX that Mark Gill used for his EdenStation IPX project. The Aurora chassis was also used on the SPARCstations 4 and 20, as well as a number of server-oriented versions. The SS5 seems to be the most widely available though. I picked mine up for under £20 on eBay. 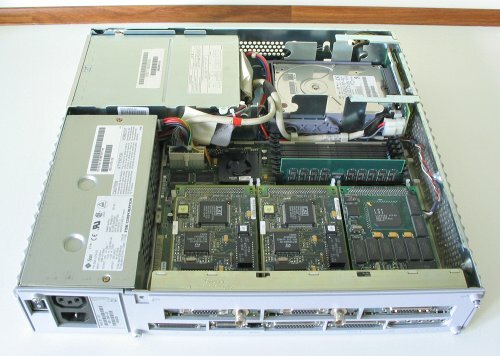 If you're buying a SPARCstation 5 for a conversion project it's worth noting that there were two versions of the Aurora chassis. Pre-1996 machines were fitted with a normal-sized 3.5" floppy drive, and a specially made 1" high CD-ROM. 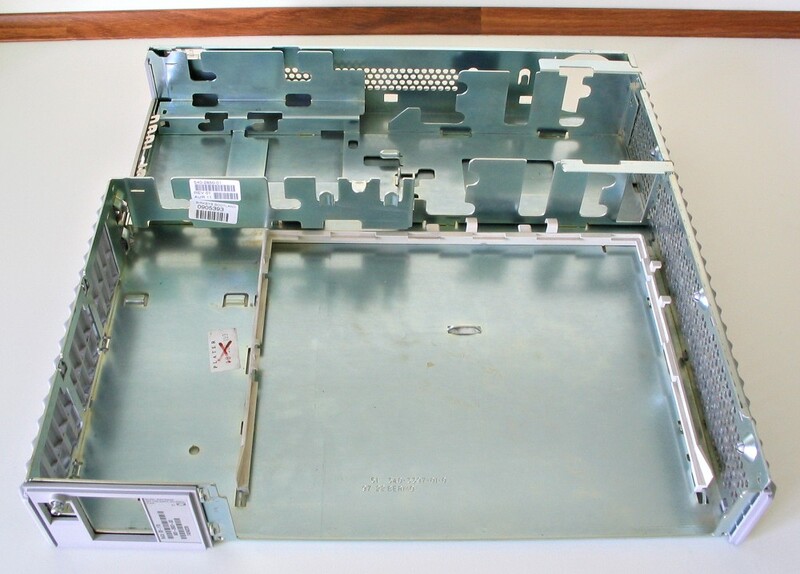 In the post-1996 version, Sun squeezed down the floppy drive bay to allow the fitting of a full-sized CD-ROM drive. The smaller floppy drive in the newer machines is of the same form factor as the widely available slim-line PC floppy drives. 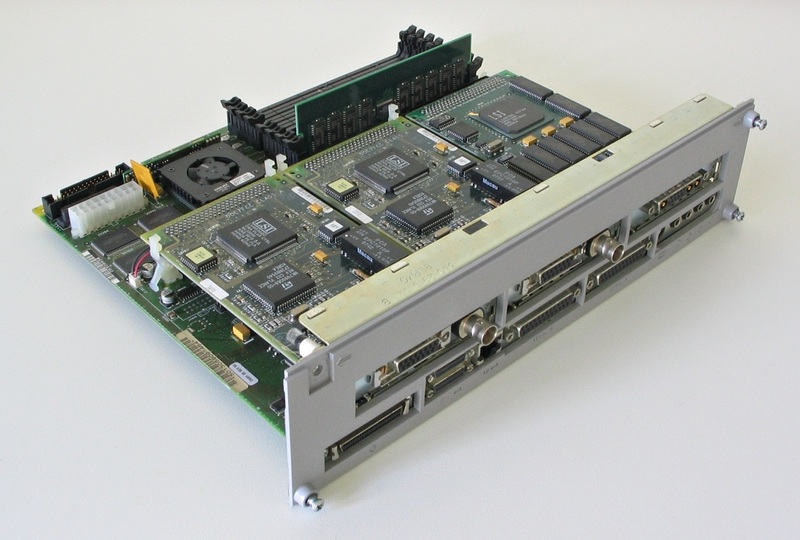 This motherboard is fitted with three cards: from left to right, two network cards and a graphics card. Server versions of the SPARCstation 5 were available with no graphics card fitted. 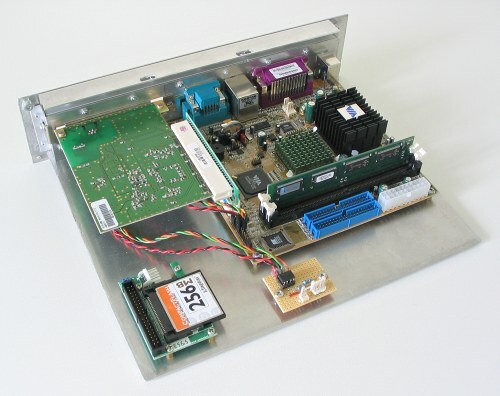 The 170MHz TurboSPARC CPU is hidden under a small heatsink and fan, near the far left corner of the board as seen from this angle. Variants with 70, 85 and 110 MHz MicroSPARC CPUs were also available. There's the EPIA 5000 motherboard, a 1U PCI riser card, a PCI ADSL modem, and for storage a compact flash-to-IDE adapter with a 256MB CF card. The other small circuit board that you can see is to control the case LED - more on that later. Now for the power supply. I'm using a Morex 55W fanless power supply kit. For neatness I wanted to mount the power-brick inside the case. That does carry the risk of overheating problems; but the SPARCstation case is very well ventilated, and I haven't had any heat problems with the machine so far. 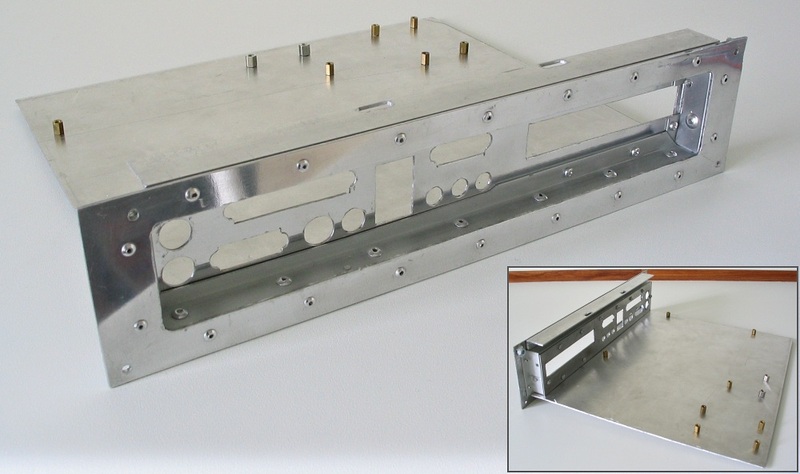 I fabricated a tray to hold the power supply components that would slot in in place of the Sun PSU. Again this was sheet aluminium, with a little bit of galvanised steel mesh on the side to stop too much RFI escaping out of the large holes in the side of the SPARCstation case. On the back panel of the PSU tray I installed an IEC mains inlet socket, a hard power switch, and a push-button switch to connect to the motherboard's power switch header. Now for some assembly! The motherboard module slides in on the original plastic rails, and the PSU slots in. They're secured with a few screws. I dropped the original floppy drive back in - just to fill the hole really, I'm not using it as the EPIA 5000 has no floppy interface. On top of that I fitted an old 12X-speed IDE CD-ROM drive. It's not actually connected, as I'm not using it at the moment. 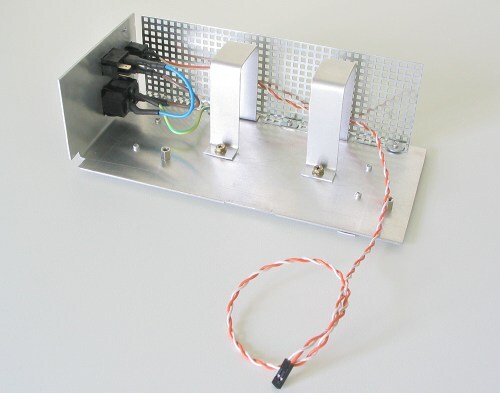 It only draws 0.8A on the 12V rail so I probably could use it if I needed it, even with the weedy 55W power supply. A couple of additional details of the case assembly: first a look at the left side of the front of the case, where the speaker is normally fitted. 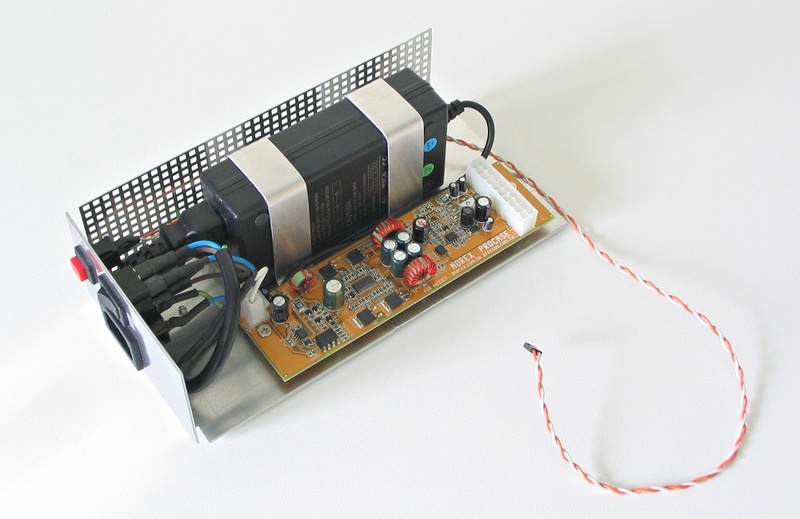 The EPIA motherboard has an on-board buzzer so the case speaker isn't needed. 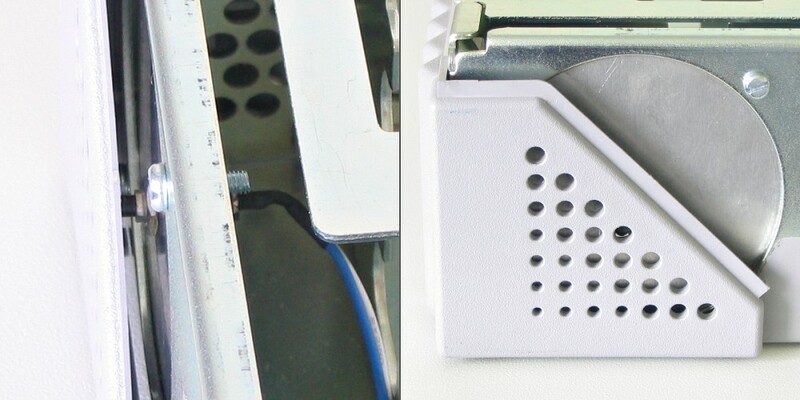 I covered the hole with a piece of aluminium and used that as a mounting for a small reset button, hidden behind the speaker grille. If you wanted to fit additional lights to a SPARCstation 5 case, this would be a handy place to do that as well. 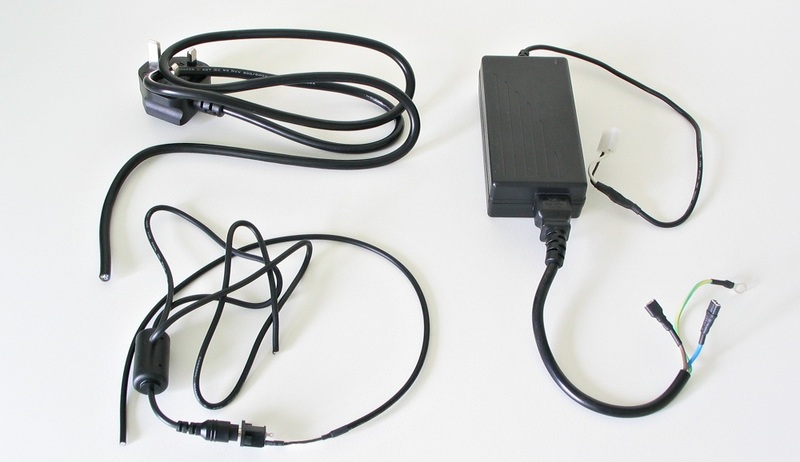 The small circuit board in the picture above lights the single case LED dimly to indicate power-on, and flashes it brighter to show disk activity. The IC on the circuit board contains two optocouplers, into which the LED signals from the motherboard are fed to perform the switching. You could probably do the same thing slightly cheaper with transistors, but using the optocoupler is simpler and has the advantage of isolating the expensive motherboard from my dodgy electronics.